Yello is a Swiss electronic band consisting of Dieter Meier and Boris Blank. The band is known for their 1985 single “Oh Yeah“ which featured in the films Ferris Bueller‘s Day Off, The Secret of My Success, American Pie Presents. 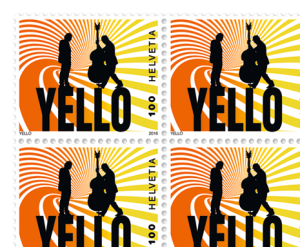 To commemorate this legendary music band Swiss Post has released a special stamps that StampNews.com is glad to introduce to your attention. 37 years making Swiss musical history and still going strong. Dieter Meier and Boris Blank: Two men who achieved worldwide fame with their music.Sound experiments in an automobile test lab marked the birth of the band Yello in 1979, and albums like “Stella” revolutionized electronic music in the early eighties. Worldwide hits including “The Race”, “Oh Yeah” and “Bostich” garnered the musical duo Dieter Meier and Boris Blank major chart successes in the USA, Germany, UK and Switzerland. In 1997 the pair received the Art Prize of the City of Zurich, and in 2014 they were presented with the German Echo Lifetime Achievement Award to honour their 35 years in the business.